This blog explains why, in the process of time-domain interpolation (sample rate increase), zero stuffing a time sequence with zero-valued samples produces an increased-length time sequence whose spectrum contains replications of the original time sequence's spectrum. 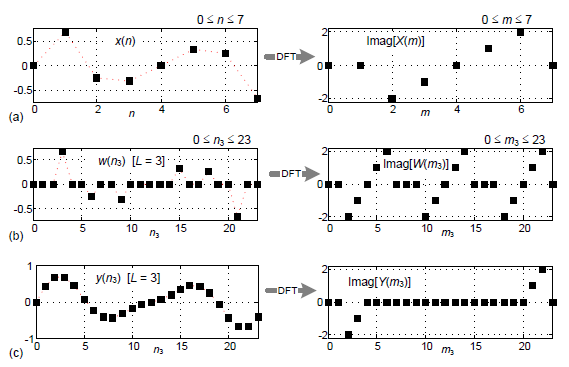 The traditional way to interpolate (sample rate increase) an x(n) time domain sequence is shown in Figure 1. The '↑ L' operation in Figure 1 means to insert L–1 zero-valued samples between each sample in x(n), creating a longer-length w(n3) sequence. (The sample rate of the x(n) input is fs/L samples/second.) To the end of that longer sequence we append L–1 zero-valued samples. Those two steps are what we call "upsampling." Next, we apply the upsampled w(n3) sequence to a lowpass filter whose output is the interpolated y(n3) sequence. 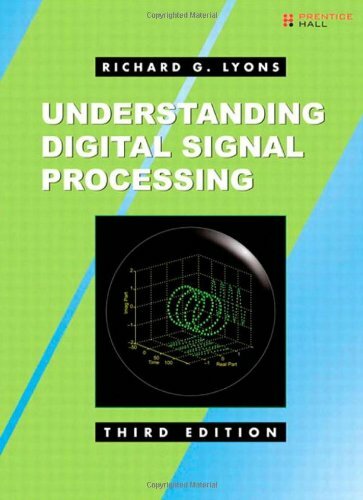 We formally refer to interpolation as the two-step process of upsampling followed by lowpass filtering. An example of the Figure 1 process is given in Figure 2. In this example the input x(n) time sequence is the sum of two sine waves. The discrete Fourier transform (DFT) of x(n) is X(m). Because the x(n)sequence comprises sine waves, the real parts of X(m) are zero-valued. As such, we'll plot the imaginary parts of the X(m) spectral samples as the Imag[X(m)] sequence shown on the right side of Figure 2(a). Upsampling x(n) by L = 3 produces the w(n3) sequence shown at the left side of Figure 2(b). 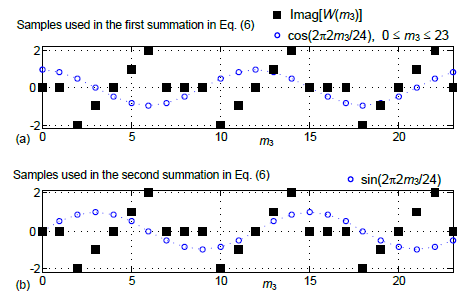 The imaginary parts of the W(m3) DFT spectral samples are represented by the Imag[W(m3)] sequence shown on the right side of Figure 2(b). Notice that the Imag[W(m3)] sequence contains replications of the Imag[X(m)] spectral samples. "Why does inserting zero-valued samples in x(n) to produce w(n3) result in a W(m3) spectrum containing replications of the original X(m) spectral samples?" One answer to our question involves recalling how the DFT of several periods of a periodic time signal is a discrete Fourier series (DFS). 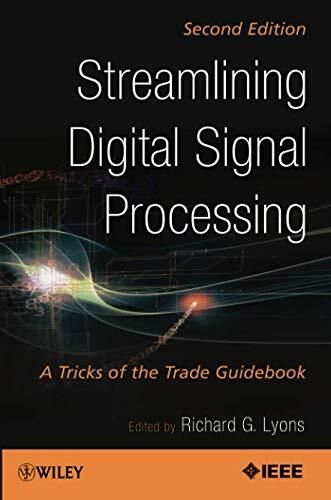 That is, a DFS containing non-zero-valued spectral samples separated by zero-valued spectral samples. 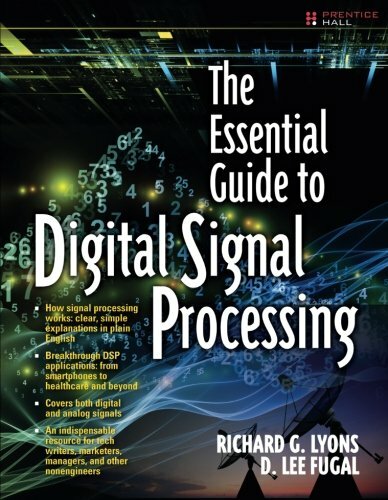 In our Figure 2(b) case we exchange the traditional DFS time and frequency domains. 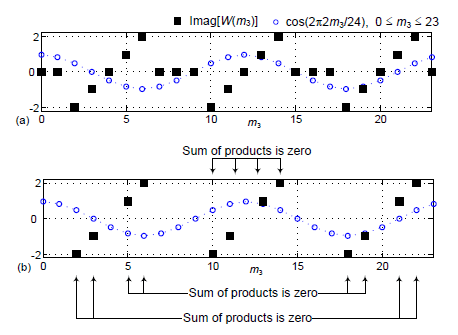 The inverse DFT of several periods of a periodic W(m3) spectrum results in a w(n3) time sequence containing non-zero-valued time samples separated by zero-valued time samples. OK, given that hand-waving intuitive answer we now present an alternate answer to our question by way of an example. An alternate answer to our question comes from our realization that the two sequences in Figure 2(b) are Fourier transform pairs. That is, we can show that the inverse DFT of the Imag[W(m3)] sequence really does produce the zero-valued samples in the w(n3) time sequence. For example, let's show why the w(1) and w(2) samples are zero-valued as shown on the right side of Figure 3. Pictorially, the summation in Eq. (3) is the summation of the products of the black square dots times the blue circular dots as shown in Figure 4(a). While not immediately obvious, the sum of those products is equal to zero. 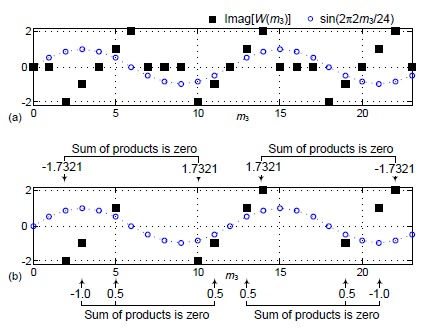 We show this zero-valued summation in Figure 4(b) where the black squares that produce individual zero-valued products are omitted for clarity. Graphically, the summation in Eq. (4) is the summation of the products of the black square dots times the blue circular dots as shown in Figure 5(a). We show Eq. (4)'s zero-valued summation in Figure 5(b) where the zero-valued black squares are omitted for clarity. The numbers on the arrows in Figure 5(b) are the individual products of square and circular sample pairs. So, we have shown that w(1)'s real and imaginary parts are both zero-valued and now we see why w(1) = 0 in Figure 3(b). Similar to Figure 4, the first summation in Eq. (6) is the summation of the products of the black square dots times the blue circular dots as shown in Figure 6(a). The second summation in Eq. (6) is the summation of the dots given in Figure 6(b). And both summations in Eq. (6) are equal to zero as shown in the Appendix. Thus w(2)'s real and imaginary parts are both zero-valued and now we see why w(2) = 0 in Figure 3(b). 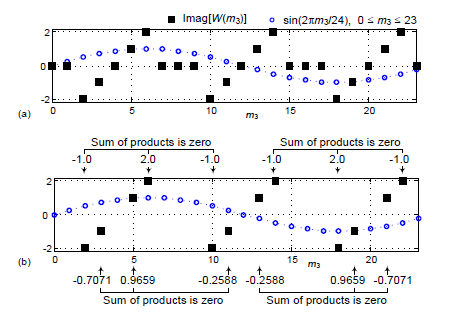 If we cared to do so, we could also show that the inverse DFT Figure 3's Imag[ W(m3)] sequence produces the remaining zero-valued "stuffed" samples, w(4), w(5), w(7), w(8), etc., in the w(n3) sequence. And that would, hopefully, answer this blog's question: "Why does time domain zero stuffing produce spectral replications." This Appendix shows why the w(2) time sample in Figure 3(b) is zero-valued. Pictorially, the summation in Eq. (A-2) is the summation of the products of the black square dots times the blue circular dots as shown in Figure A1(a). 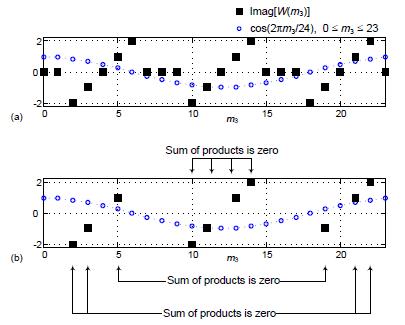 While not immediately obvious, the sum of the products is equal to zero. We show this zero-valued summation in Figure A1(b) where the zero-valued black squares are omitted for clarity. Graphically, the summation in Eq. (A-3) is the summation of the products of the black square dots times the blue circular dots as shown in Figure A2(a). We show Eq. (A-3)'s zero-valued summation in Figure A2(b) where the black squares that produce individual zero-valued products are omitted for clarity. The numbers on the arrows in Figure A1(b) are the individual products of square and circular sample pairs. That concludes our proof that the Figure 3(b) w(2) time sample's real and imaginary parts are both zero-valued, thus w(2) = 0.